American test pilot mission specialist astronaut 1980-2012. Shared world record of seven spaceflights. Status: Inactive; Active 1980-2012. Born: 1948-01-20. Spaceflights: 7 . Total time in space: 58.04 days. Birth Place: Crown Point, Indiana. Educated Purdue; Edwards. USAF test pilot. PERSONAL DATA:� Born January 20, 1948, in Crown Point, Indiana.� He is married to the former Karen S. Pearson of Sheridan, Indiana.� They have two children.� He enjoys genealogy, traveling, photography, stained glass, woodworking and model rocketry.� His parents, Donald J. Ross and Phyllis E. (Dillabaugh) Ross, are deceased.� Karen’s mother, Wilma Pearson, resides in Sheridan, Indiana. Her father, Morris D. Pearson is deceased. EDUCATION:� Graduated from Crown Point High School, Crown Point, Indiana, in 1966; received Bachelor of Science and Master of Science degrees in Mechanical Engineering from Purdue University in 1970 and 1972, respectively. ORGANIZATIONS:� Lifetime Member of the Association of Space Explorers, the Purdue Alumni Association and the Clan Ross Association of the USA.� He served on the Board of Directors of the Association of Space Explorers, USA from 2011 through 2013. SPECIAL HONORS:� Awarded two Defense Superior Service Medals, the Air Force Legion of Merit, four Defense Meritorious Service Medals, two Air Force Meritorious Service Medals and the National Intelligence Medal of Achievement.� He was a Distinguished Graduate of the United State Air Force Test Pilot School and the recipient of the Outstanding Flight Test Engineer Award, Class 75B.� Ross received 15 NASA medals. 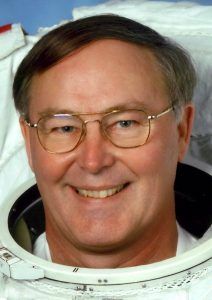 ��He was awarded the American Astronautical Society’s Victor A. Prather Award for spacewalking achievements (1985, 1990 and 1999) and the Flight Achievement Award (1992, 1996, 1999 and 2002).� Ross received an Honorary Doctor of Science degree from Purdue University in 2000 and the Distinguished Engineering Alumnus Award from Purdue University in 2004.� His home town school system has named an elementary school in his honor. In May 2014, Ross was inducted into the Astronaut Hall of Fame. AIR FORCE EXPERIENCE:� Ross, an Air Force ROTC student at Purdue University, received his commission upon graduation in 1970.� After receiving his master’s degree from Purdue in 1972, he entered active duty with the Air Force and was assigned to the Ramjet Engine Division of the Air Force Aero-Propulsion Laboratory at Wright-Patterson Air Force Base, Ohio.� He conducted computer-aided design studies on ramjet propulsion systems, served as the project engineer for captive tests of a supersonic ramjet missile using a rocket sled track and served as the project manager for preliminary configuration development of the ASALM strategic air-launched missile.� From June 1974 to July 1975, he was the Laboratory Executive Officer and Chief of the Management Operations Office.� Ross graduated from the United States Air Force Test Pilot School’s Flight Test Engineer Course in 1976 and was subsequently assigned to the 6510th Test Wing at Edwards Air Force Base, California.� While on assignment to the 6510th’s Flight Test Engineering Directorate, he was project engineer on a limited flying qualities evaluation of the RC-135S aircraft and, as lead B-1 flying qualities flight test engineer, he was responsible for the stability and control and flight control system testing performed on the B-1 aircraft.� He was also responsible, as chief B-1 flight test engineer, for training and supervising all Air Force B-1 flight test engineer crewmembers and for performing mission planning for the B-1 offensive avionics test aircraft. Ross has flown in 21 different types of aircraft, holds a private pilot’s license and has logged more than 4,100 flying hours, the majority in military aircraft.� He retired from the Air Force on March 31, 2000. NASA EXPERIENCE:� In February 1979, Ross was assigned by the Air Force to the Payload Operations Division at the Lyndon B. Johnson Space Center as a payload officer/flight controller, responsible for the flight operations integration of military payloads into the space shuttle.� Ross was selected as an astronaut in May 1980.� His technical assignments since then have included EVA (spacewalks); Robotics; Space Shuttle Landing Chase Team; support crewman for STS-41B, 41C and 51A; spacecraft communicator (CAPCOM) during STS-41B, 41C, 41D, 51A and 51D; Chief of the Mission Support Branch; member of the 1990 Astronaut Selection Board; Acting Deputy Chief of the Astronaut Office; Chief of the Astronaut Office EVA and Robotics Branch and Astronaut Office Branch Chief for Kennedy Space Center Operations Support.� From 2004 to 2007, he served as the Chief Astronaut of the NASA Engineering and Safety Center (NESC). Ross flew as a mission specialist on STS-61B (1985), STS-27 (1988) and STS-37 (1991); was the Payload Commander on STS-55/Spacelab-D2 (1993); and served as a mission specialist on the second space shuttle to rendezvous and dock with the Russian Space Station Mir, STS-74 (1995), the first International Space Station assembly mission, STS-88 (1998) and on another Space Station assembly mission, STS-110 (2002).� A veteran of seven space flights, Ross has more than 1,393 hours in space, including 58 hours and 18 minutes of EVA on nine spacewalks.� He was the first human to be launched into space seven times.� These seven flights comprise a world record that Ross now shares with one other NASA astronaut.� Both his number of spacewalks and time on spacewalks are all time second highest among NASA astronauts. He retired from NASA on his birthday, January 20, 2012, and released his autobiography, “Spacewalker:� My Journey in Space and Faith as NASA’s Record-Setting Frequent Flyer” in January 2013.� He will release a children’s book, “Becoming a Spacewalker, My Journey to the Stars” in September 2014. SPACEFLIGHT EXPERIENCE: STS-61B was launched at night from Kennedy Space Center, Florida, on November 26, 1985.� During the mission, the crew deployed the MORELOS-B, AUSSAT II and SATCOM Ku-2 communications satellites and operated numerous experiments inside the space shuttle.� Ross conducted two 6-hour spacewalks to demonstrate Space Station construction techniques with the EASE/ACCESS experiments.� After completing 108 Earth orbits in 165 hours, 4 minutes and 49 seconds, STS-61B Atlantis landed on Runway 22 at Edwards Air Force Base, California, on December 3, 1985. STS-27 Atlantis launched from the Kennedy Space Center, Florida, on December 2, 1988.� The mission carried a Department of Defense payload as well as a number of secondary payloads.� After 68 Earth orbits in 105 hours, 6 minutes and 19 seconds, the mission concluded with a dry lakebed landing on Runway 17 at Edwards Air Force Base, California, on December 6, 1988. STS-37 Atlantis launched from KSC on April 5, 1991, and deployed the 35,000-pound Gamma Ray Observatory, the heaviest civilian satellite ever launched by a Shuttle and the second of NASA’s four “great observatories.”� Ross performed two spacewalks totaling 10 hours and 49 minutes to manually deploy the obstructed Gamma Ray Observatory antenna and to test prototype Space Station EVA hardware.� After 93 Earth orbits in 143 hours, 32 minutes and 44 seconds, the mission concluded with a landing on Runway 33 at Edwards Air Force Base on April 11, 1991. From April 26, 1993, to May 6, 1993, Ross served as Payload Commander/Mission Specialist on STS-55 aboard the Orbiter Columbia.� The mission launched from Kennedy Space Center and landed at Edwards Air Force Base, Runway 22, after 160 Earth orbits in 239 hours and 45 minutes.� Nearly 90 experiments were conducted during the German-sponsored Spacelab D-2 mission to investigate life sciences, material sciences, physics, robotics, astronomy and Earth and its atmosphere. STS-74 was NASA’s second space shuttle mission to rendezvous and dock with the Russian Space Station Mir.� STS-74 launched on November 12, 1995, and landed at Kennedy Space Center on November 20, 1995.� During the 8-day flight the crew aboard Atlantis attached a permanent docking module to Mir, conducted a number of secondary experiments and transferred 3,000 pounds of supplies and experiment equipment between Atlantis and the Mir station.� The STS-74 mission was accomplished in 129 Earth orbits, with Atlantis traveling 3.4 million miles in 196 hours, 30 minutes and 44 seconds. STS-88 Endeavour (December 4 to December 15, 1998) was the first ISS assembly mission.� During the 12-day mission, the U.S.-built Unity module was mated with the orbiting, unmanned Russian Zarya module.� Ross performed three spacewalks totaling 21 hours and 22 minutes to connect umbilicals and attach tools and hardware to the exterior of the core modules of the station.� The crew also deployed two small satellites, Mighty Sat 1 and SAC-A.� The mission was accomplished in 185 Earth orbits in 283 hours and 18 minutes. STS-110 Atlantis (April 8-19, 2002) was the 13th Shuttle mission to visit the ISS.� This, the first mission in the final phase of the ISS assembly, included the delivery and installation of the S0 (S-Zero) Truss, the first use of the station’s robotic arm to maneuver spacewalkers around the station and the first time that all of the spacewalks performed on a Shuttle mission were based from the Station’s Quest Airlock.� Ross performed two EVAs totaling 14 hours and 9 minutes.� Mission duration was 259 hours and 42 minutes, with 171 Earth orbits. Ross supported the Space Shuttle Program as an astronaut from before the first launch in April 1981 to the last landing in July 2011.� He also supported the International Space Station Program from its inception through the completion of assembly of the space station in 2011. Born January 20, 1948, in Crown Point, Indiana. Married to the former Karen S. Pearson of Sheridan, Indiana. They have two children. He enjoys softball, racquetball, woodworking, photography, model rocketry, and flying. His mother, Mrs. Phyllis E. Ross, resides in Crown Point. His father, Donald J. Ross, is deceased. Her parents, Mr. and Mrs. Morris D. Pearson, reside in Sheridan, Indiana. Graduated from Crown Point High School, Crown Point, Indiana, in 1966; received bachelor of science and master of science degrees in Mechanical Engineering from Purdue University in 1970 and 1972, respectively. Member of the Association of Space Explorers, the Air Force Association, Pi Tau Sigma; and a lifetime member of the Purdue Alumni Association. Awarded the Defense Superior Service Medal, the Defense Meritorious Service Medal with 2 Oak Leaf Clusters, the Air Force Meritorious Service Medal with 1 Oak Leaf Cluster; named a Distinguished Graduate of the USAF Test Pilot School and recipient of the Outstanding Flight Test Engineer Award, Class 75B. Recipient of 5 NASA Space Flight Medals. Awarded the American Astronautical Society, Victor A. Prather Award (1985 and 1990), and Flight Achievement Award (1992 and 1996). Ross, an Air Force ROTC student at Purdue University, received his commission upon graduation in 1970. After receiving his master's degree from Purdue in 1972, he entered active duty with the Air Force and was assigned to the Ramjet Engine Division of Air Force Aero-Propulsion Laboratory at Wright-Patterson Air Force Base, Ohio. He conducted computer-aided design studies on ramjet propulsion systems, served as the project engineer for captive tests of a supersonic ramjet missile using a rocket sled track, and as the project manager for preliminary configuration development of the ASALM strategic air-launched missile. From June 1974 to July 1975, he was the Laboratory Executive Officer and Chief of the Management Operations Office. Ross graduated from the USAF Test Pilot School's Flight Test Engineer Course in 1976 and was subsequently assigned to the 6510th Test Wing at Edwards Air Force Base, California. While on assignment to the 6510th's Flight Test Engineering Directorate, he was project engineer on a limited flying qualities evaluation of the RC-135S aircraft and, as lead B-1 flying qualities flight test engineer, was responsible for the stability and control and flight control system testing performed on the B-1 aircraft. He was also responsible, as chief B-1 flight test engineer, for training and supervising all Air Force B-1 flight test engineer crew members and for performing the mission planning for the B-1 offensive avionics test aircraft. Ross has flown in 21 different types of aircraft, holds a private pilot's license, and has logged over 2,800 flying hours, the majority in military aircraft. In February 1979, Ross was assigned to the Payload Operations Division at the Lyndon B. Johnson Space Center as a payload officer/flight controller. In this capacity, he was responsible for the flight operations integration of payloads into the Space Shuttle. Ross was selected as an astronaut in May 1980. His technical assignments since then have included: EVA, RMS, and chase team; support crewman for STS 41-B, 41-C and 51-A; spacecraft communicator (CAPCOM) during STS 41-B, 41-C, 41-D, 51-A and 51-D; Chief of the Mission Support Branch; member of the 1990 Astronaut Selection Board; and Acting Deputy Chief of the Astronaut Office. A veteran of five space flights, Ross has logged 850 hours in space, including nearly 23 hours on four spacewalks. Ross was a mission specialist on the crew of STS 61-B which launched at night from Kennedy Space Center, Florida, on November 26, 1985. During the mission the crew deployed the MORELOS-B, AUSSAT II, and SATCOM Ku-2 communications satellites, conducted two 6-hour space walks to demonstrate Space Station construction techniques with the EASE/ACCESS experiments, and operated numerous other experiments. After completing 108 orbits of the Earth in 165 hours, STS 61-B Atlantis landed on Runway 22 at Edwards Air Force Base, California, on December 3, 1985. Ross then flew as a mission specialist on the crew of STS-27, on board the Orbiter Atlantis, which launched from the Kennedy Space Center, Florida, on December 2, 1988. The mission carried a Department of Defense payload, as well as a number of secondary payloads. After 68 orbits of the earth in 105 hours, the mission concluded with a dry lakebed landing on Runway 17 at Edwards Air Force Base, California, on December 6, 1988. Ross flew as a mission specialist on STS-37 aboard the Orbiter Atlantis. The mission launched from KSC on April 5, 1991, and deployed the 35,000 pound Gamma Ray Observatory. Ross performed two space walks totaling 10 hours and 49 minutes to manually deploy the stuck Gamma Ray Observatory antenna and to test prototype Space Station Freedom hardware. After 93 orbits of the Earth in 144 hours, the mission concluded with a landing on Runway 33, at Edwards Air Force Base, on April 11, 1991. From April 26, 1993 through May 6, 1993, Ross flew as Payload Commander/Mission Specialist on STS-55 aboard the Orbiter Columbia. The mission launched from Kennedy Space Center and landed at Edwards Air Force Base, Runway 22, after 160 orbits of the Earth in 240 hours. Nearly 90 experiments were conducted during the German-sponsored Spacelab D-2 mission to investigate life sciences, material sciences, physics, robotics, astronomy, and the Earth and its atmosphere. Most recently, Ross was a mission specialist on STS-74, NASA's second Space Shuttle mission to rendezvous and dock with the Russian Space Station Mir. STS-74 launched on November 12, 1995, and landed at Kennedy Space Center on November 20, 1995. During the 8 day flight the crew aboard Space Shuttle Atlantis attached a permanent docking module to Mir, conducted a number of secondary experiments, and transferred 1-1/2 tons of supplies and experiment equipment between Atlantis and the Mir station. The STS-74 mission was accomplished in 129 orbits of the Earth, traveling 3.4 million miles in 196 hours, 30 minutes, 44 seconds. Colonel Ross will serve on the crew of STS-88, the first Space Shuttle mission to carry hardware to space for the assembly of the International Space Station. He is scheduled to conduct 3 space walks on this mission. Launch is targeted for July 1998. Family: Astronaut. Country: USA. Spacecraft: ISS, Mir. Flights: STS-61-B, STS-62-A, STS-27, STS-37, STS-55, STS-74, STS-88, STS-110. Projects: STS. Agency: USAF. Bibliography: 12, 5952. 1948 January 20 - . Birth of Jerry Lynn Ross - . Nation: USA. Related Persons: Ross. American test pilot mission specialist astronaut 1980-2012. Shared world record of seven spaceflights. 7 spaceflights, 58.0 days in space. Flew to orbit on STS-61B (1985), STS-27, STS-37, STS-55, STS-74, STS-88, STS-110..
STS-61-B - . Call Sign: Atlantis. Crew: Cleave, Neri Vela, O Connor, Ross, Shaw, Spring, Walker. Payload: Atlantis F02 / EASE / ACCESS. Mass: 21,791 kg (48,040 lb). Nation: USA. Related Persons: Cleave, Neri Vela, O Connor, Ross, Shaw, Spring, Walker. Agency: NASA Houston. Program: STS. Class: Manned. Type: Manned spaceplane. Flight: STS-61-B. Spacecraft Bus: Shuttle. Spacecraft: Atlantis. Duration: 6.88 days. Decay Date: 1985-12-03 . USAF Sat Cat: 16273 . COSPAR: 1985-109A. Apogee: 370 km (220 mi). Perigee: 361 km (224 mi). Inclination: 28.50 deg. Period: 91.90 min. Manned seven crew. Deployed Morelos 2, Aussat 2, Satcom K2, OEX. Payloads: Deploy SATCOM (RCA-Satellite Communi-cations) Ku-2 with Payload Assist Module (PAM)-D II. Deploy Morelos (Mexico communications satellite)-B with PAM-D. Deploy AUSSAT (Australian communications satellite)-2 with PAM-D. EASE/ACCESS (Assembly of Structures� Assembly Concept for Construction of Erectable Space Structures) by extravehicular activity (EVA) astronauts, Continuous Flow Electrophore-sis System (CFES), Diffusive Mixing of Organic Solutions (DMOS), IMAX camera, one getaway special (GAS), Linhof camera and Hasseblad camera. 1985 November 29 - . EVA STS-61-B-1 - . Crew: Ross, Spring. EVA Duration: 0.23 days. Nation: USA. Related Persons: Ross, Spring. Program: STS. Class: Manned. Type: Manned spaceplane. Flight: STS-61-B. Spacecraft Bus: Shuttle. Spacecraft: Atlantis. Began EASE/ACCESS (Assembly of Structures / Assembly Concept for Construction of Erectable Space Structures) structural assembly experiments..
1985 December 1 - . EVA STS-61-B-2 - . Crew: Ross, Spring. EVA Duration: 0.28 days. Nation: USA. Related Persons: Ross, Spring. Program: STS. Class: Manned. Type: Manned spaceplane. Flight: STS-61-B. Spacecraft Bus: Shuttle. Spacecraft: Atlantis. Completed EASE/ACCESS (Assembly of Structures / Assembly Concept for Construction of Erectable Space Structures) structural assembly experiments..
1985 December 3 - . Landing of STS-61-B - . Return Crew: Cleave, Neri Vela, O Connor, Ross, Shaw, Spring, Walker. Nation: USA. Related Persons: Cleave, Neri Vela, O Connor, Ross, Shaw, Spring, Walker. Program: STS. Flight: STS-61-B. STS-61-B landed at 21:33 GMT. .
1988 December 6 - . Landing of STS-27 - . Return Crew: Gardner, Guy, Gibson, Mullane, Ross, Shepherd. Nation: USA. Related Persons: Gardner, Guy, Gibson, Mullane, Ross, Shepherd. Program: STS. Flight: STS-27. STS-27 landed at 23:43 GMT. .
1991 April 7 - . EVA STS-37-1 - . Crew: Apt, Ross. EVA Duration: 0.19 days. Nation: USA. Related Persons: Apt, Ross. Program: STS. Class: Manned. Type: Manned spaceplane. Flight: STS-37. Spacecraft Bus: Shuttle. Spacecraft: Atlantis. Manually deployed Gamma-Ray Observatory's high-gain antenna..
1991 April 8 - . EVA STS-37-2 - . Crew: Apt, Ross. EVA Duration: 0.25 days. Nation: USA. Related Persons: Apt, Ross. Program: STS. Class: Manned. Type: Manned spaceplane. Flight: STS-37. Spacecraft Bus: Shuttle. Spacecraft: Atlantis. Tested CETA (Crew / Equipment Translation Aids - rail with cart for moving astronauts around exterior of International Space Station)..
1991 April 11 - . Landing of STS-37 - . Return Crew: Apt, Cameron, Godwin, Nagel, Ross. Nation: USA. Related Persons: Apt, Cameron, Godwin, Nagel, Ross. Program: STS. Flight: STS-37. STS-37 landed at 13:56 GMT. .
STS-74 - . Call Sign: Atlantis. Crew: Cameron, Hadfield, Halsell, McArthur, Ross. Payload: Atlantis F15 / 316GK SM. Mass: 6,134 kg (13,523 lb). Nation: USA. Related Persons: Cameron, Hadfield, Halsell, McArthur, Ross. Agency: NASA Houston. Program: Mir. Class: Manned. Type: Manned spaceplane. Flight: Soyuz TM-22, STS-74. Spacecraft Bus: Shuttle. Spacecraft: Atlantis. Duration: 8.19 days. Decay Date: 1995-11-20 . USAF Sat Cat: 23714 . COSPAR: 1995-061A. Apogee: 342 km (212 mi). Perigee: 257 km (159 mi). Inclination: 51.60 deg. Period: 91.40 min. Rendezvoused and docked with Mir space station on November 15. Delivered the Russian-built 316GK Shuttle-Mir docking module to Mir.Payloads: Shuttle-Mir Mission 2; docking module with two attached solar arrays; IMAX Cargo Bay Camera (ICBC); Glow Experiment (GLO-4)/ Photogrammetric Appendage Structural Dynamics Experiment (PASDE) Payload (GPP); Shuttle Amateur Radio Experiment (SAREX) II. 1995 November 20 - . Landing of STS-74 - . Return Crew: Cameron, Hadfield, Halsell, McArthur, Ross. Nation: USA. Related Persons: Cameron, Hadfield, Halsell, McArthur, Ross. Program: Mir. Flight: Soyuz TM-22, STS-74. STS-74 landed at 17:02 GMT. .
STS-95 Mission Status Report # 19 - . Nation: USA. Related Persons: Duque, Ross. Program: STS. Flight: STS-95. 1998 November 16 - . ISS Status Report 1 - . Nation: USA. Related Persons: Currie, Newman, Ross. Program: ISS. 1998 November 23 - . 1998 November 30 - . 1998 December 2 - . ISS Status Report 10 - . Nation: USA. Related Persons: Newman, Ross. Program: ISS. 1998 December 8 - . 22:10 GMT - . EVA STS-88-1 - . Crew: Newman, Ross. EVA Duration: 0.31 days. Nation: USA. Related Persons: Newman, Ross. Program: ISS. Class: Manned. Type: Manned space station. Flight: STS-88. Spacecraft: ISS. Began assembly of International Space Station. 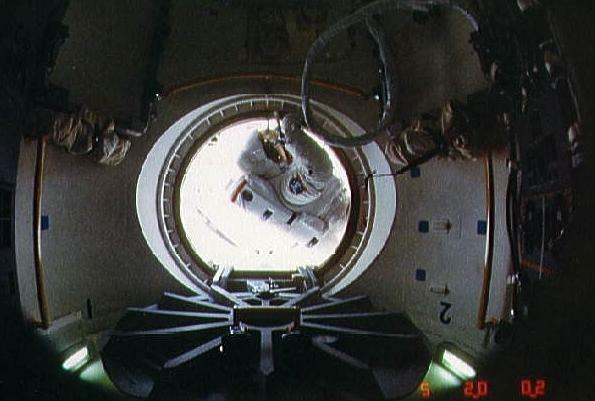 Connected cables between Zarya and Unity modules..
STS-88 Mission Status Report # 14 - . Nation: USA. Related Persons: Currie, Newman, Ross. Program: ISS. Flight: STS-88. 1998 December 10 - . 20:33 GMT - . EVA STS-88-2 - . Crew: Newman, Ross. EVA Duration: 0.29 days. Nation: USA. Related Persons: Newman, Ross. Program: ISS. Class: Manned. Type: Manned space station. Flight: STS-88. Spacecraft: ISS. Continued assembly of International Space Station. Connected cables between Zarya and Unity modules and deployed antennae..
1998 December 12 - . 1998 December 13 - . 20:33 GMT - . EVA STS-88-3 - . Crew: Newman, Ross. EVA Duration: 0.29 days. Nation: USA. Related Persons: Newman, Ross. Program: ISS. Class: Manned. Type: Manned space station. Flight: STS-88. Spacecraft: ISS. Completed initial assembly of International Space Station. A canvas tool bag was attached to the exterior of Unity to provide tools for future assembly workers. Also disconnected some docking cables, so that Unity and Zarya could no longer undock..
1998 December 23 - . ISS Status Report: ISS12 - . Nation: USA. Related Persons: Newman, Ross. Program: ISS. 1999 December 24 - . STS-103 Mission Status Report #11 - . Nation: USA. Related Persons: Grunsfeld, Ross, Smith, Steven. Program: STS. Flight: STS-103. STS-99 Mission Status Report #21 - . Nation: USA. Related Persons: Ross. Program: STS. Flight: STS-99. 2000 May 27 - . 2000 May 29 - . 2000 July 13 - . ISS Status Report: ISS 00-28 - . Nation: USA. Related Persons: Ross. Program: ISS. 2000 July 31 - . 2000 September 17 - . STS-106 Mission Status Report #20 - . Nation: USA. Related Persons: Altman, Burbank, Lu, Malenchenko, Mastracchio, Morukov, Ross, Wilcutt. Program: ISS. Flight: STS-106. 2000 October 22 - . STS-92 Mission Status Report #24 - . Nation: USA. Related Persons: Chiao, Duffy, Lopez-Alegria, McArthur, Melroy, Ross, Wakata, Wisoff. Program: ISS. Flight: STS-92. 2000 October 24 - . STS-92 Mission Status Report #28 - . Nation: USA. Related Persons: Chiao, Duffy, Lopez-Alegria, McArthur, Melroy, Ross, Wakata, Wisoff. Program: ISS. Flight: STS-92. 2000 December 4 - . STS-97 Mission Status Report #09 - . Nation: USA. Related Persons: Bloomfield, Garneau, Gidzenko, Jett, Noriega, Ross, Shepherd, Tanner. Program: ISS. Flight: Soyuz TM-31, STS-97. STS-102 Mission Status Report #16 - . Nation: USA. Related Persons: Ross, Thomas, Andrew, Wetherbee. Program: ISS. Flight: Soyuz TM-31, STS-102, STS-102 ISS EO-2. 2001 March 20 - . 2001 April 22 - . 2001 July 15 - . STS-108 Mission Status Report #13 - . Nation: USA. Related Persons: Ross. Program: ISS. Flight: STS-105 ISS EO-3, STS-108, STS-108 ISS EO-4. 2002 August 26 - . International Space Station Status Report #02-38 - . Nation: USA. Related Persons: Korzun, Ross, Sellers, Whitson, Wolf. Program: ISS. Flight: STS-111 ISS EO-5. 2002 October 17 - . STS-112 MCC Status Report #20 - . Nation: USA. Related Persons: Ashby, Korzun, Magnus, Melroy, Ross, Sellers, Whitson, Wolf, Yurchikhin. Program: ISS. Flight: STS-111 ISS EO-5, STS-112. 2002 October 18 - . 2002 November 15 - . 2003 January 3 - . International Space Station Status Report #03-1 - . Nation: USA. Related Persons: Bowersox, Budarin, Pettit, Ross. Program: ISS. Flight: STS-113 ISS EO-6. 2003 February 14 - . International Space Station Status Report #03-7 - . Nation: USA. Related Persons: Bowersox, Budarin, Pettit, Ross. Program: ISS. Flight: STS-113 ISS EO-6. 2003 October 3 - .